We are also applying our discovered inhibitors as molecular probes to investigate the regulation and biogenesis of miRNAs. 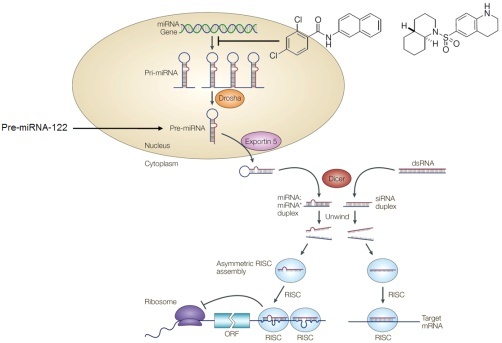 We have already identified that our miRNA inhibitors act on the transcriptional level by either directly inhibiting miRNA expression or by modulating the regulation of their transcription. Supplying a downstream component of the pathway, pre-miRNA-122, eliminates the inhibitory activity of our compounds, further validating that they act on early steps of the pathway. We are currently using our structure-activity knowledge of these molecules in order to generate probes that can be used for the identification of the actual protein targets of these miRNA inhibitors.